Here's a little card for the Less is More challenge 56 with the theme DON'T SCRAP IT. 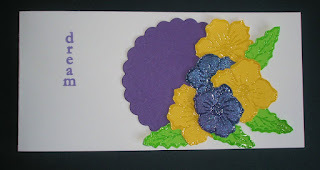 I have to admit I do challenges to try and use up bits in my box - had a search through and pulled out some bright bits - the scalloped circle was left over from another project and I just clear embossed the Sketchy Flowers and Leaf stamps (Oak House Studio) on the scraps of card. Then looking for a base card I came across a strip left over from making a 6 x 6 card and decided to use that. I stamped Dream down the side but think it would make a pretty Thank You notelet. Thanks for looking. This looks really pretty Elaine! Super use of your scraps. The colors remind me of Mardi Gras colors....regal and royal!! Beautiful images! Such a pretty card. I really like the flowers and the happy, bright colours. What a great Spring bouquet. Love the bright colors, Elaine! I saw your card on the Less is More Challenge. The colors caught my eye. Your background of the blog is so pretty too.